At the end of 2018, IBM extended the concept of token licensing from the Rational brand to the Maximo suite of products. Put simply, tokens are the most flexible method of licensing – in place of one licence per user for each software product, a pool of tokens can be consumed based on actual product usage in real-time. It’s a floating software entitlement – across users and across selected products. 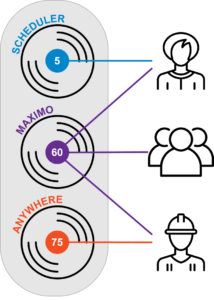 Until recently, Limited and Express Maximo user types consumed the same number of tokens as Authorised users. In April 2019 IBM announced updates to the token calculator to better accommodate the different types of users, making token licensing an even more attractive proposition for certain organisations. In this article, we’ll touch on the what, why and how of token licensing for IBM Maximo, and outline how to decide whether it’s the right option for you. Remember the TimeZone arcades? Where kids’ hard earned pocket money is exchanged for tokens to activate pinball machines, video games or the prize grabbing claw based on the designated price of tokens per game? Token licensing can be thought of in a similar way. Each software product requires a designated number of tokens. 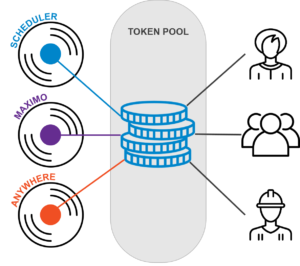 When a user logs in, the associated tokens are consumed from the pool available. Unlike the TimeZone analogy however (where tokens are lost forever in exchange for a few minutes of fun and possibly a stuffed toy), when the user logs out, tokens are released back to the pool for the next person to use. Under the token model, you manage one part number – tokens – for the entire platform. As the only limit is the total number of tokens available in the pool, there’s no need to adjust licensing for individual products as needs vary. This means greater efficiency in managing entitlements and a closer alignment between available licences and average utilisation. Moreover, your compliance is simplified as you cannot exceed your entitlement of tokens. Each product consumes a designated number of tokens from a central pool depending on how many users are accessing it at any given time. Token Management: Tokens are managed in the Licence Key Centre. You will need to install a token Licence Server which provides data for reporting purposes and makes it easier to manage. Token usage must be reported to IBM every 12 months. At the end on your token contract, you can choose to either renew or revert back to the perpetual licences owned at the outset of the contract. Renewing for a further contract term is an excellent opportunity to increase or decrease the token count and/or add further products to be available under the token model. You have a high number of concurrent users. If you run multiple shifts, have a pool of contractors or support users who only need to log in occasionally for a specific purpose (such as approving a Purchase Order), it’s likely that the token model will work in your favour. Because tokens are consumed and released back into a central pool, the need for individual named entitlements is eliminated when users don’t all need to be logged in at the same time. As a general rule of thumb, if around 60% of your workforce could work from a shared pool, then it’s worth considering token licensing. You are looking to rebalance/rightsize your licences. Needs vary over time, and you may find that your perpetual licence entitlements no longer align with actual usage of Maximo and its add-ons. Because token licences float across users AND products, you can essentially start and stop using different products at any time, eliminating the compliance overhead of maintaining specific product type and licence counts. Returning to our earlier example, let’s say only 40 of your 60 Maximo licences are actually required now as a result of organisational change and maturing work practices. A growing interest in location analysis means that you would also like to start using Maximo Spatial. Traditionally, you would be required to determine the number of Spatial users and purchase licences accordingly, but the token model allows unused capacity to be applied against the new product set (assuming it is listed on your agreement) without fear of non-compliance. Flexibility is really the overarching benefit of the token model. It gives organisations the agility to adapt and change their use of products across the Maximo suite as needs evolve. The compliance risk (and associated management overheads) are virtually eliminated, leaving dynamic organisations free to innovate. Start by understanding your concurrent usage. Contact us for a free, no-obligation discussion to find out how.